An ambitious inquiry into the human psyche and examining the value of one’s life – questioning if it’s really all that it can be. Swedish novelist and playwright Jonas Hassen Khemiri’s new play, The Hundred We Are, presents an emotionally compelling view on the different stages of one’s self encountered over a lifetime. From the time we are born, until the time of our passing, we learn to adapt to our surroundings and transition from life phase to life phase, with our evolution as a human being marked as life’s most important journey. Audiences are in for a treat as this provocative and progressive new play examines many of the important social issues occurring throughout the world in a fresh and truly thought-provoking way. From the time the audience sits down, they are instantly drawn to a projector at the front of the room that displays an iPhone screen that seems to be capturing the scope of the present audience. A careful double-take shows that it is not in fact, the present audience, but a generated one that looks scarily similar. That opening visual leaves you thinking that you’ve stepped into some sort of time warp and instantly tests your attention. Soon after, four women appear on stage, with three in the exact same outfit of a casual denim dress with a gold necklace – the only difference being the shoe choices. The costume designer, Jenny Green, strategically selects age-appropriate choices, such as a comfortable and trendy pair of high-tops to represent youthfulness or sturdy and classic clogs to represent an older style – signifying the different stages and personalities in one’s life. Under Erwin Maas’ intricate direction, it is apparent that these women have been carefully chosen to embody the various voices we host in our head during the course of our development, as they stem from different backgrounds and worldviews, and clash at every corner. Mirirai Sithole plays the part of a young, blunt know-it-all who is fighting her way through a world of trial and conformism, as she breaks the mold and does things her own way. Sithole does a knock-out job illustrating the sauciness, intelligence, and stubbornness that many young millennials can relate to, through the eyes of her character. The second woman, Orlagh Cassidy who plays the responsible and put-together housewife is always encouraging the young radical to listen and have more patience, and is always met with a smart response. Cassidy takes on her role with such carefulness and obedience, and struggles to understand the mind of the rebellious young woman – as she can’t imagine marching to a different drum. 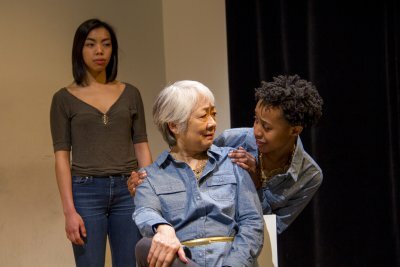 The third woman, played by Kitty Chen, is the sage elder, doesn’t even speak until the very end — just soaking it all in and then depositing her priceless wisdom at the very end, to tie everything together. Chen’s calm and gentle nature is refreshing to experience, in the midst of all the turmoil. 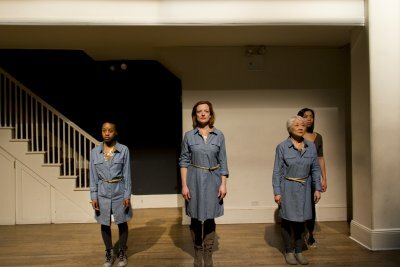 Overall, the combination of dispositions leave audiences on their toes and entertained the entire time – as these women don’t miss a beat when testing each other’s limits to the point of no return. Caitlin Cisco is referred to as the “shadow” and oversees the interactions of these women from an outside perspective. Her poise and “tell-it’ like-it-is” manner builds trust with the audience as she shares what is happening on stage and fills in blanks. The lighting designer, Derek Van Heel, keeps the focus on the women as they travel through space and time to share their story, as lights dim for intense moments and brighten for individual spotlighted scenes. The technical production design by Jack Gilliat relies on minimalism, with a video camera used as the main prop to document the journey. The value of having these women’s conversations and thoughts documented adds to the futuristic angle and is another tool for having their legacy preserved. The cell provides an intimate space for the play and allows just enough room for the performers to tell their story, without the distraction of a full stage or set. It is comparable to being in a friend’s living room, with the action being right up close and personal. The Hundred We Are takes on quite an ambitious inquiry into the human psyche and examining the value of one’s life – questioning if it’s really all that it can be. Like the show’s characters, we often try to make our lives appear in the best light, when inside, we are crumbling. The cast hits an emotional cord when it allows those pieces to be cracked open and we see their struggles in a new light. It brings up important issues around one’s identity and the many people we become (or tell ourselves we are) during the course of a lifetime. For an intense and revealing look at the state of humanity, The Hundred We Are provides an epiphany worth considering. Ribald, raucous and bawdy pop rock musical from the 18th century picaresque novel by Henry Fielding is a delightful romp with a pertinent message. Although the writing often veers into cliché, the actors and the director find freshness and candor in the material. Plots erupt at a girl’s school in Ghana during selections for the Miss Universe pageant in this comedy that’s superbly staged and wonderfully performed. A young woman’s beauty incites jealousy in this Nigerian fable unevenly adapted for the stage. It’s dynamically presented and sensationally performed. A dense, overwritten, yet poetic introduction to an award-winning playwright’s career.